Combining the best and most recent evangelical Christian scholarship with the highly regarded ESV text, the ESV Study Bible is one of the most comprehensive study Bibles ever published. The ESV Study Bible was designed to help you understand the Bible in a deeper way. Created by a diverse team of 95 leading Bible scholars and teachers--from 9 countries, nearly 20 denominations, and 50 seminaries, colleges, and universities--the ESV Study Bible features a wide array of study tools, making it a valuable resource for serious readers, students, and teachers of God's Word. 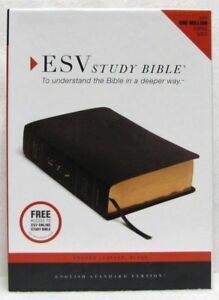 Winner of the 2008 ECPA Book of the Year Award The ESV Study Bible was created to help people understand the Bible in a deeper way. Combining the best and most recent evangelical Christian scholarship with the highly regarded ESV text, it is the most comprehensive study Bible ever published. The ESV Study Bible features more than 2,750 pages of extensive, accessible Bible resources, including completely new notes, full-color maps, illustrations, charts, timelines, and articles created by an outstanding team of 93 evangelical Christian scholars and teachers. In addition to the 757,000 words of the ESV Bible itself, the notes and resources of the ESV Study Bible comprise an additional 1.1 million words of insightful explanation and teaching-equivalent to a 20-volume Bible resource library all contained in one volume. Black letter text Finest quality European Bible paper Durable Smyth-sewn bindings on all editions Lifetime guarantee on materials and binding on all leather and TruTone(R) Bibles Free access to the ESV Online Study Bible with purchase of any print edition Over 1 million ESV Study Bibles sold Winner of the 2009 ECPA Christian Book of the Year Award! See for yourself why the ESV Study Bible is the first study bible ever to receive this prestigious award. Sales tax may apply when shipping to: AZ*(6.6%), CA(7.5%), FL*(6.0%), IL*(8.75%), IN*(7.0%), IA*, MA*(6.25%), MI*(6.0%), MN*, NV(8.1%), NJ*(7.0%), PA*(6.0%), SC*(9.0%), TN*(9.25%), TX*(6.25%), VA(6.0%), WA*, WI*(5.0%). It is a very good study bible, I like it. It is a very good study bible, the reason why I bought it is because I keep on looking for that bible that comprise with all references and verse by verse studies which is suitable for anyone at any level to understand its teaching. The question does this bible meet what i am looking for, my response is it is the best I have found so far. However I keep on searching until I can find that special study bible that I have in mind. Thanks!